Framefixers can do eyeglass repair on lenses as well as frames! Whether you own prescription lenses, non-prescription sunglass lenses, or clear sport lenses, cleaning them and caring for them is critical to their enjoyment and longevity. 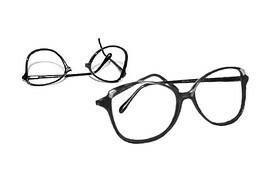 Framefixers can repair eyeglass frames and lenses. With the multitude of microfiber cleaning cloths available today, you should never be forced into using any other cloth for wiping a lens. The basic lens-wiping question is always the same: Wet or Dry? If you are going to wipe a lens without any lens cleaning fluid, then the cloth should always be a microfiber cloth designated as a lens friendly cloth and no other. Eyewear care kits are available everywhere today, and some come with a handy purse or jacket pocket size lens cleaning fluid bottle, as well as a good quality microfiber cloth. Disposable lens wipes are very handy for environments where abrasives are present, like the beach, or construction sites. Dry wall powder is one of the most abrasive dusts in our environment, and even walking through an area being remodeling can expose your lenses to truly abrasive powder. Disposable wet cloths are actually superior in that they dispose of any abrasive dust that they wipe off the lens every time, rather than recycling the dust back to the lens and collecting it for each progressive wipe. Choosing a fluid to clean a lens of cosmetic smears or fingerprints should always involve a fluid approved for optics. Household cleaners should never be used, in particular any glass cleaner that contains ammonia as these will damage the final coatings on the lens surface such as the anti-glare or the anti-scratch coating and produce a pattern of coating removal referred to as “lacing”. This will eventually become more visible until it interferes with vision. Unfortunately, coating damage is not repairable and new lenses will need to be provided. Using those chemicals will cause damage requiring eyeglass repair. Storage of eyewear is always an issue with everyone having a hectic and busy lifestyle where eyewear goes on and off from home to car to office to outdoor activities. The old saying of “On-your-face-or-in-the-case” is fine and true, but practicality must be recognized. Visor clips are one accessory that can greatly improve the wear and longevity of lenses by holding the frame up and away from all other surfaces keeping the frame clean and free of abrasion. Lenses all have a raised center as a result of what is referred to as the “base curve”. Whether the lenses are prescription or a non-prescription, the very center of the lens protrudes out from the main body of the lenses, and if the frame is placed front-down, the very first part that touches the surface is that lens center section. Unfortunately this section is also the most critical part of the lens, the most visible, and the very first spot the wearer will notice if there is a scratch or an abrasive clouding in the material. Placing the frame into an approved case, with a micro fiber lining is the best practice. It only takes a few seconds longer, but it will extend the life of the lenses substantially and prevent the need for eyeglass repair. A final product warning that can save a very expensive set of lenses from irreversible damage is hairspray. It is the vehicle or evaporate in hairspray that acts as a solvent and damages lens surfaces in a manner that unfortunately can not be repaired. Always take your eyewear off before applying any hairspray, and cover the eyewear with a cloth or paper rather than leaving them open on a countertop in proximity to the application of sprays. This, together with the aforementioned practices will help you retain the investment you have made in your eyewear far longer and keep the clarity and effectiveness of your lenses working for you and your vision. Another style that went from being the predominant style in the eyeglass frame world to being almost impossible to find is cable ends on the temples. Browse through any Antique Center or Vintage Clothing store and you will see that almost every pair of those beautifully decorated and delicately framed eyeglasses had curved wire ends or “cable ends” at the end of the temple arms. We get calls every day from customers who have a cable end that broke, or need them placed on their existing eyeglass frames only to be told “No one does that work anymore”. Windsurfers, horseback riders and tennis players risked damaging or loosing their frames altogether without the security of cable ends. Once again at FRAMEFIXERS, we sought out sources for cable end stock, in may cases buying new entire frames just to get the cable ends, and the ferrules, gold solders and equipment to attach cable ends to temple arms. We have even designed and built an alignment platform with adjustable clamping heads to properly set the angle and position of cable ends while they are being welded to the temple arm ends. This alignment table has also proved itself invaluable when we repair broken nose bridge assemblies by holding the two halves of the frame in perfect relation to each other during welding. We got the idea for this table from an old photo of frame makers assembling turn-of-the-century eyeglass frames in France, back when the prescription you were given had the frame width, nose bridge width and temple arm length on the prescription, and the eyewear center made the frame to your required measurements, instead of selling you an off-the-rack pair as with frames and men’s suits today. So if you have fallen in love with a stylish eyeglass frame that has cable ends or hinges of the type that “No one works on anymore”, wear them and enjoy them as much as you wish, because as long as we are here, they can always be restored.